Les Roches Blanches welcomes companies looking for an exceptional setting for their seminars, by privatizing a part of the establishment. 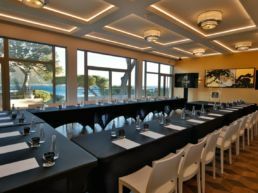 Rooms from 15 to 80 people, the possibility to privatize partially or totally the hotel, and the Winston’s suite and its 80m2 terrace for your special events. For any enquiry, please contact us by email commercial@roches-blanches-cassis.com.